Technology, Skills and the Pre-Modern Economy in the East and the West. Guilds have attracted scholarly attention for a long time but the study of guilds had been limited to Europe. Guilds have been mostly perceived as rent-seeking organizations seeking privilege from state. Recently, the perception has somewhat changed and the contribution of guilds to economic development has been emphasized. The key figure in the rehabilitation debate has been S. R. Epstein. Epstein argued that guilds “sustained interregional specialized labor markets and contributed to technical diffusion through migrant labor and by providing inventors with temporary monopoly rents”. 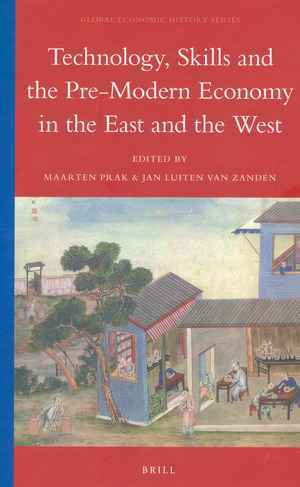 Technology, Skills and the Pre-modern Economy in the East and West is dedicated to the memory and work of S. R. Epstein. The book draws on Epstein’s argument and seeks to assess the role of guilds for human capital formation and technology innovation in various areas of Europe and Asia. The goal of this volume of collected papers has been to investigate the role of crafts in facilitating technological innovation in different parts of the world. It aims to contribute to the Great Divergence debate by studying the roots of economic divergence in the pre-modern era. As is stated in the introduction to the volume, it “concentrates, in Epstein footsteps, on the skill angle” of the Great Divergence debate. The book focuses on pre-modern technology and pre-modern labor relations and adopts a ‘craft perspective’ of innovation, which shifts emphasis from individual to collective forms of invention. The introduction sets the volume in broader framework of historiographical debate. The book is divided into two parts, chapters in part one focuse on regional perspectives and chapters in part two on industry perspectives in order to assess the guilds’ contribution to economic development in different regions and industries. The first chapter is written by S. R. Epstein himself and sets the stage by presenting an argument that the other chapters in the volume assess. Epstein studies pre-modern technical progress across Europe. He argues here that “a distinctly European technological system emerged from the late eleventh century, based on craft-based apprenticeship training, non-ascriptive membership of craft associations, and, increasingly, inter-state competition for skilled workers” (p. 65). This system created conditions for the generation, codification, and circulation of technical knowledge. Thus, guilds in Europe were supposedly more successful in creating an environment that facilitated technological innovation and human capital formation than guilds in China, India, Japan, South-East Asia or Near East. Assessing whether this argument is correct is one of the objectives guiding the chapters in the rest of the volume. Although the book is unable to give a decisive answer to the question whether the absence of European-type guilds constrained knowledge formation and innovations, it opens the debate and offers comparative perspective. Chapters by Tirthankar Roy and Kenneth Pomerantz describe Indian and Chinese institutions fostering skill formation and show that social institutions in India and China in certain respects restricted circulation of knowledge. On the other hand, there is not enough evidence to support the view that European guilds were superior. This conclusion is also supported by the evidence from individual industries, which is presented in the second part of the volume. From the studied industries, before the eighteenth century Europe was on the technological edge only in machine-making and book printing. Karel Davids’ chapter on machine-making shows that the decisive difference between knowledge of machine-making in Europe and in China was in codification of knowledge. Codification was far more frequent in Europe than in China and made circulation of knowledge easier, which as the author argues, was important for development of machine-making during the Industrial Revolution. Jan Luiten van Zanden’s contribution shows that the affordability of movable printing significantly decreased the costs of printed information and made professional literature more affordable. Other contributions in the volume demonstrate that knowledge and technology varied across Eurasia. However, this variation does not indicate that European knowledge and technology was superior. The presented evidence discloses that in spite of the variation among the institutions of collective action, no region achieved superiority in brick-making, building, or shipbuilding. Moreover, certain similarities among these regions emerged. For instance, builders’ knowledge remained practical and experimental rather than theoretical until the eighteenth century in both Asia and Europe. In manual brickmaking organization of production across Eurasia differed, yet “mechanisms of error-rate reduction adopted to ensure efficiency within these different systems belong[ed] to the same repertoire” (p. 319). Considering the differences among guild-systems and similarities of results, Christine Moll-Murata comes to the conclusion that we need a more dynamic view of guilds. A view that would take into account the diversity of guilds across early-modern world and that would take a more complex approach than ‘guild-rehabilitationist’ or ‘guild-critical’ positions as is currently the case (p. 256). Global history approaches are currently one of the dominant trends in historiography, however we still lack enough information about large parts of the early-modern world. This book represents a significant addition to the Great Divergence debate, it offers a well-synthesized look on the role of guilds in knowledge formation and technology innovation and diffusion in several regions of Eurasia in pre-modern period. In the discussion of the comparative role of guild-type institutions in pre-modern era, the book touches upon a broad range of issues crucial for the understanding of economic divergence in the modern era. The volume takes a comparative approach and presents evidence from a wide variety of industries. Moreover, it switches scholarly focus to the discussion of early-modern technology, human capital and labor organization on global scale, that is to topics previously less-studied within the Great Divergence debate. Several chapters have challenged the view that guilds had irreplaceable role and suggested that there existed alternative mechanisms of skill-formation and technology innovation. The volume offers interesting new insights but rather than just offering conclusive answers, the authors open the discussion of institutional mechanisms that regulated industrial development in the pre-industrial period. S. R. Epstein, Craft guilds, apprenticeship, and technological change in preindustrial Europe, in: The Journal of Economic History 58 (1998), p. 684. For discussion of ‘craft perspective’ see: Robert C. Allen, Collective invention’, in: Journal of Economic Behaviour and Organization 4 (1983), 1-24. Hutkova Karolina: Rezension zu: Prak, Maarten; Luiten van Zanden, Jan (Hrsg. ): Technology, Skills and the Pre-Modern Economy in the East and the West. Leiden 2013 , in: Connections. A Journal for Historians and Area Specialists, 24.04.2015, <www.connections.clio-online.net/publicationreview/id/rezbuecher-21495>.